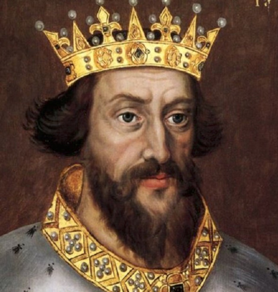 King Henry II, though born in France on March 5, 1133 at Le Mans, he became King of England. He came from the Plantagenet, which was the family name of a line of kings that ruled England from 1154 to 1399. These kings descended from the marriage of Matilda, daughter of King Henry I, to Geoffrey, count of Anjou, France. Geoffrey was nicknamed "Plantagenet," because he wore a sprig of the broom (genet) plant in his cap. His reign in England was from December 19, 1154, the date of his coronation, till July 6, 1189. Henry II was a grandson of William the Conqueror. Numerous historians also call these kings "Angevins," meaning from Anjou. The Plantagenet dynasty began with Henry II, son of Matilda and Geoffrey. Henry II is the 14th great grandfather of Englishman Edward Southworth, the first husband of Alice Carpenter, my seven times great grandmother. My descending from her is through her second husband, Plymouth Colony Governor William Bradford, a Mayflower passenger which came to America in 1620. Henry II is a pivotal point in tying together two ancient ancestries related to our families. He is the 10th great grandson of Halfdan Vanha Sveidasson, Earle of the Uplands of Norway (an eighth century Viking) and Henry is the 35th great grandson of Godwulf. Godwulf is the 65th great grandfather of my Westmoreland grandchildren, though he is not directly related to me, but through their father, Steve O. Westmoreland. Godwulf is the earliest ancestor to whom any of our modern-day relatives can claim relationship. Godwulf's descendants travel down through the family line of my son-in-law, Steven O. Westmoreland. Godwulf's birth occurred just months following the event of Mount Vesuvius erupting on August 24, 79 AD, burying the Roman cities of Pompeii and Herculaneum in volcanic ash. An estimated 20,000 people died. Henry married Eleanor of Aquitaine on May 18, 1152. They bore eight children, and Henry reportedly gave issue to two illegitimate children. When Henry and Eleanor married, her marriage to Louis VII of France had recently been annulled. Henry II was the first King of England to come from the Plantagenet family. He reigned from 1154 until his death in 1189. He became known as the founder of the English system of common law, including introducing the use of juries and other legal procedures we consider common today. Henry II, first of the Angevin kings, was one of the most effective of all England's monarchs. He came to the throne amid the anarchy of Stephen's reign and promptly collared his errant barons. He refined Norman government and created a capable, self-standing bureaucracy. His energy was equaled only by his ambition and intelligence. Henry survived wars, rebellion, and controversy to successfully rule one of the Middle Ages' most powerful kingdoms. "Common law is a body of rulings made by judges, on the basis of community customs and previous court decisions. It forms an essential part of the legal system of many English-speaking countries, including the United States and Canada. Common law covers such matters as contracts, ownership of property, and the payment of claims for personal injury. "Early in England's history, judges decided cases according to the way they interpreted the beliefs and unwritten laws of the community. If another judge had ruled in an earlier, similar case, that judge's decision was often used as a precedent (guide). After many judges decided the same question in a similar way, the ruling became law. "Common law is often contrasted with civil law, a body of rules passed by a legislature. Under civil law, a judge decides a case by following written rules, rather than previous court decisions. Common law also differs from equity, a set of standards developed to allow greater flexibility in court decisions. During the late Middle Ages, England created courts of equity to decide cases that courts of common law might treat too strictly. These courts decided cases by broad principles of justice and fairness, rather than by the rigid standards of common law. The monarch's chancellor presided over a court of equity called the court of chancery. "The legal system of the United States has developed from English common law and equity. Only one U.S. state, Louisiana, modeled its legal system on civil law. Louisiana used the civil law of France, called the Code Napoleon. During the late 1800's, many state scombined their courts of common law and courts of equity. One group of judges administers the combined courts. In Canada, similarly, only the province of Quebec based its legal system on French law. " Contributor: David M. O'Brien, Ph.D., Professor. of Government, University. of Virginia, World Book Encyclopedia, 1998. The marriage of Henry II to Eleanor of Aquitaine made him Duke of Aquitaine at the time. He became King of England when King Stephen died. He not only ruled over England, but most of France, and claimed Ireland, Scotland, and Wales. It was later that his two sons rebelled against him, and each in his own time became King of England. Henry II came into conflict with Thomas Becket, archbishop of Canterbury, over Henry's attempts to curb the independence of the church. In 1170, four of Henry's knights, believing they were acting on the King's orders, murdered Becket in his cathedral. From Sir Winston Churchill Kt, 1675: "Henry II Plantagenet, the very first of that name and race, and the very greatest King that England ever knew, but withal the most unfortunate . . . his death being imputed to those only to whom himself had given life, his ungracioussons . . ."
Though close in time, Henry I, son of William the Conqueror, is not the father of Henry II. Rather Henry I is the grandfather of Henry II. "The history of Windsor Castle begins in the year 1070, when William the Conqueror built the original wooden structure located in what is now the inner most point of the castle. William chose the site for its superior military advantages; namely, that attackers would have to battle uphill, in order to reach and overtake the castle. Although none of original wooden structure built by William remains in the Windsor Castle of today, the modern Windsor Castle still occupies the same ground. However, King Henry II was the first monarch to transform the wooden fortress to a stronghold of stone, adding a stonewall which stood tall around Windsor Castle England. Parts of this wall can still be seen today." King Henry died July 6, 1189, at age 58, in Chinon Castle, France. His burial was at Fontevraud Abbey, Anjou, France.